Welcome to my Music Diary – today for the 28th November! On the 28th November 1993, Steppenwolf drummer Jerry Edmonton died at the age of 47. He was killed in a car crash in Santa Barbara, California. Jerry’s real name was Gerald McCrohan (born on the 24th October 1946 in Oshawa, Ontario, Canada). With his brother Dennis Eugene (who changed his name into Mars Bonfire), he was performing in Toronto in a band called Sparrow. Singer John Kay and keyboarder Goldy McJohn joined this group in 1965 and after some personal changes and moving to California the band was renamed in Steppenwolf. With the third single „Born to be wild“ (1968) they recorded a real rock classic and a motorcycle hymn, which was also featured in the movie „Easy Rider“ (1969). Until the first break-up in 1972, Steppenwolf recorded more hits like „The Pusher“ and „Magic Carpet Ride„. In 1974 the first band reunion featuring Johny Kay, Jerry Edmonton, Goldy McJohn with George Biondo (bass) and Bobby Cochran (nephew of Eddie Cochran) on lead guitar took place – this line-up consited until the next split iIn 1976. Jerry didn’t join further band reunions which happened all over the years by John Kay. Welcome to my Music Diary – today for the 27th November! Happy birthday to James Marshall “Jimi” Hendrix, who was born on the 27th November 1942 in Seattle, Washington. Jimi is still considered as one of the greatest guitarists of all time. In the sixties he started his career and worked with The Isley Brothers, Little Richard and Curtis Knight and the Squires. In 1966 Hendrix moved to London and started his own group The Jimi Hendrix Experience and recorded the three legendary milestones “Are You Experienced“, “Axis: Bold as Love” (both 1967) and “Electic Ladyland” (1968) including the hits „Hey Joe„, „Purple Haze„, „The Wind Cries Mary“ and „Voodoo Chile„. In 1969 Hendrix headlined the festival in Woodstock and one year later at the Isle of Wight. On the 18th September 1970, Jimi Hendrix died from barbiturate-related asphyxia at the age of only 27 years. Although his very short career spanned only over four years, he is widely regarded as one of the most influential electric guitarists in Rock history. The Jimi Hendrix Experience was inducted into the Rock and Roll Hall of Fame in 1992 and Jimi was appropriately described as „arguably the greatest instrumentalist in the history of rock music“. Welcome to my Music Diary – today for the 26th November! Happy birthday to singer, dancer and actress Annie Mae Bullock aka Tina Turner, who was born on the 26th November 1939 in Brownsville, Tennessee. With her husband Ike Turner (she married the musician in 1962), she recorded under the moniker Ike & Tina Turner the classics „A Fool in Love“ (1960), „River Deep Mountain High“ (1966), „Proud Mary“ (1971) and „Nutbush City Limits“ (1973) before getting divorced in 1976. Seven years later Tina Turner had a successful comeback: In 1983 the single „Let’s Stay Together“ charted worldwide and reached the top ten. Also the LP „Private Dancer“ (her fifth solo album released in 1984) became a huge success. Over 8 millions copies were sold worldwide until today. And more hits followeld like the megahit „What’s Love Got to Do with It“ (1984). TIna Turner was also working as an actress: So she played the „The Acid Queen“ in The Who rock musical „Tommy“ (1975). Ten years later she took over a role in the blockbuster „Mad Max Beyond Thunderdome“ and in „Last Action Hero“ (1993) she acted in a cameo role. Tina Tuner is also called „The Queen of Rock’n’Roll“ and she is one of most successful female rock artists ever. She received eight Grammys and sold over 100 million albums and singles worldwide. Welcome to my Music Diary – today for the 25th November! On the 25th November 1974 the British singer and songwriter Nick Drake died in his sleep at the age of only 26 years. In his very short career he recorded the three albums „Five Leaves Left“ (1969), „Bryter Layter“ and „Pink Moon“ (both 1972). Although all of them didn’t succeed and sold very badly, these recordings became legendary milestones. Nick Drake suffered from depression and on the 25th November 1972 he died from an overdose of amitriptyline. It was never resolved if it was an accident or suicide. The automobile concern Volkswagen featured Drake’s song „Pink Moon“ in a TV spot in 2000. After that, all recordings by Nick Drake sold more than in the previous thirty years. Many artists name Nick Drake as a big influence – like Robert Smith (The Cure), Peter Buck (R.E.M. ), Paul Weller (The Jam and The Style Council), Beck and also The Black Crowes – just to name a few. Welcome to my Music Diary – today for the 24th November! 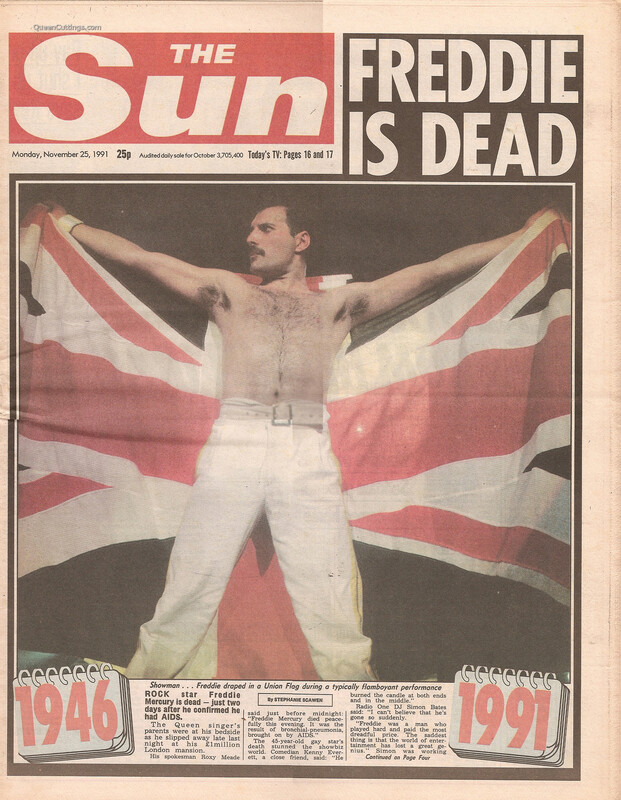 On the 24th November 1991 the Rock world lost one of the greatest and charismatic frontman of all time: Queen singer Freddie Merucry passed away at the age of only 45. Just the day before, Freddie admitted he was HIV positive. Merucry died of bronchopneumonia brought on by AIDS.